How do I use my Store's FreightQuote Add On? If you have purchased 3dcart's FreightQuote Add-on and have received confirmation that it has been installed, you may use the following information to complete your store's integration. In the Carrier section, you should now see a section for your newly installed FreightQuote module. If you do not see the above module, contact your add-on project manager. Click "Save Changes" to set your credentials. *Your 3dcart store will always consider the Default Shipping Class when retrieving quotes from your FreightQuote account, unless another shipping class is entered at an individual product level. For example, if the shipping class for all of your products is 200, then just select 200 as the default shipping class and the system is ready to go. However, if your store contains products with a variety of shipping classes, these can be entered on each individual product using the "Custom Field 1" area of each specific product. If this is the case, you may select any shipping class from the provided drop down menu. Please see the rest of this article for information on customizing your product's shipping classes individually as needed. Configure the applicable country and state that the method will apply to. You are free to set your shipping with whatever parameters you'd like. However, remember to set the weight ranges on the method to match your freight products and weights. This way, FreightQuote options won't appear for regularly shipped items. When adding your products to your store, there are just two basic areas to consider for FreightQuote services; the product's weight and custom fields for individual product Shipping Classes. For the purposes of this article, we will assume you already know how to add product to your store. However, if you require assistance on this topic, please see the note below. Select the item you'd like to configure and click on its thumbnail image, name or ID to open it up. The product's "Information Tab" will display. Within this tab there is a section labeled "Shipping Options" and it will be located right below the product's Pricing information area. At the start of this article we explained that you can either use a global (default) shipping class for all of your products, or otherwise use individual shipping classes for each of your products as needed. For example, the majority of your products may have a Shipping Class of 50, whereas a few of your products require higher shipping class designations like 200. To add a product specific shipping class, simply add the shipping class number to the product's Custom Field section. The specific field you'll want to enter it is "Field: 1" and it will override whatever the store's default Shipping Class is set to when the item is contained in the cart. Once your store's FreightQuote Integration is complete and you have your configurations in order, here is how the functionality will appear to your shoppers. 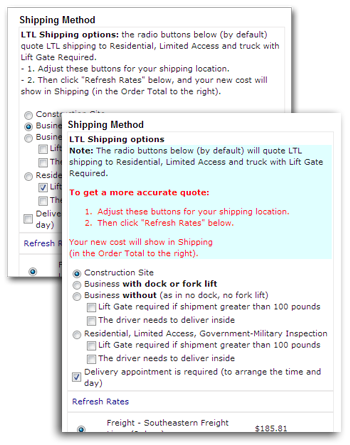 FreightQuote integration is only possible with Single Page checkout. Freight Shipping quotes are returned. 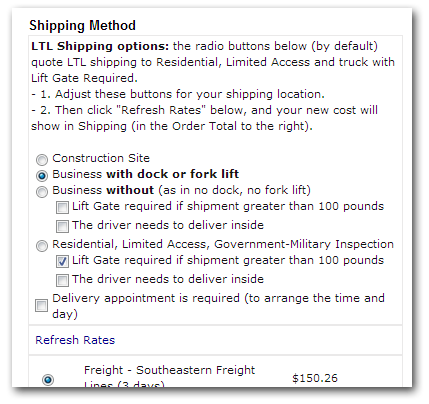 If you'd like to edit the way your FreightQuote instructions will appear to your shoppers, the listing template to edit is "checkout-singlepage.html"
After selecting their options, your shoppers are then instructed to click on the refresh link to calculate correct shipping rates for their freight order. Order Data - When viewing orders placed using FreightQuote, your orders will contain the LTL options selected above in the order's respective Comments section all the way at the bottom.